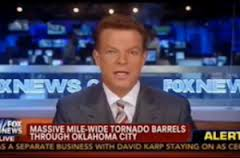 Last Friday night, I was cooking dinner and watching Sheppard Smith on FOX NEWS talking to a storm chaser in Oklahoma. The TV screen looked…green. 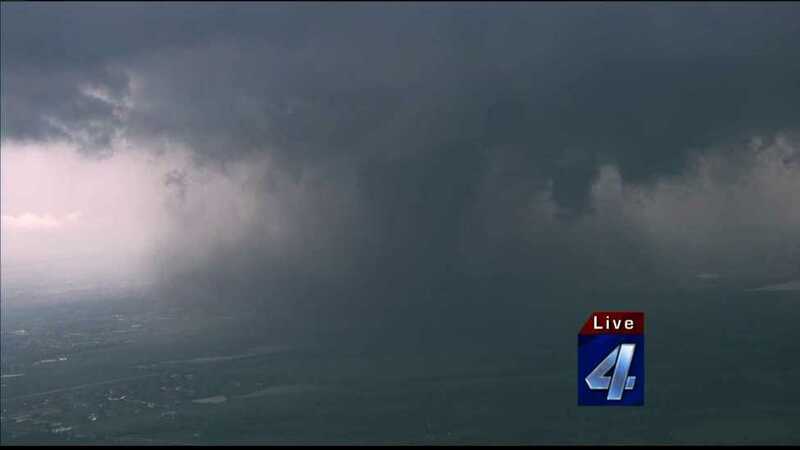 The whole Oklahoma skyline looked… green. I was wondering if some technician somewhere added some “green” just to make it look even scarier. I would have added the wicked Witch of the West zooming through the clouds on her broom for the kids, but that’s why I don’t work for a TV station. No detail is too small when it comes to the entertainment of the masses. And THIS tornado had become the most exciting thing that had happened since the LAST tornado that ‘President’ Obama has already forgot. He no doubt thought this happened in Madison. They had great camera shots of it. This was Hollywood stuff. This was Oscar worthy. This was news titillation in its finest hour. “A FARM just went over my head!” the storm chaser yelled. Money. What some people will do for it. I was flipping over the bacon, when I turned on the local news: St. Louis was also on a tornado watch. Sure enough…my husband and I went downstairs as the tornado sirens were going off and then the lights went out, almost at exactly the same time that the tornado that hit my street on April 10 this year had: 8.30pm. Cell phones weren’t working, so I was stuck with my old trusted radio, and very anxious to hear where the tornados touched down. Were they near us? Were they coming this way? Do I have time to flip the bacon? Oklahoma is used to tornadoes, but here in St. Louis people were calling up to the radio station, asking about damages, etc…..and the reporters would always say, “We’ll see what happened tomorrow.” As I laid in the dark and listened to the frightened voices on my radio, I thought the commentator was purposely being very nebulous and leaving everyone literally…in the dark. He knew what happened. He was just not going to say. His reputation was on the line. He wasn’t about to lose his job. In the meantime, people were calling up saying they had been in a Casino where the roof was ripped off, tractor trailers flipped, there were houses hit, schools torn apart, etc, and the radio host acted as if it was just a little storm. First report came in: (You KNOW how I am about first reports.) Many casualties when a hotel was hit. Drivers reported 20 ambulances arriving at the scene, but the cops said, nobody was hurt. It’s okay folks, only 100 houses have been flattened and over 200 damaged but that’s really nothing. The next day, I was stuck without a car, and so I had the Cardinal baseball game on. They were playing the Giants. KMOX is our main radio station here. It’s the only one that reports the news. Around 10 a.m. The man in charge of our local electric company came on to say that the whole city had wires down everywhere, they had 800 men out, 300 men coming in from other states, and it was reported that about 100,000 people were without electric. The numbers went all over the map in every different report. The electric man said that Governor Nixon had declared a disaster, and he would tell everyone at 2.30 pm that day, what was going on. He had to take the whole day reviewing everything. So…he SAID he’d be back at 2.30 pm, and tell us what he found out. I couldn’t wait to hear what he had to say. Nobody knew just how long their electric would be out, so I’m sure I wasn’t the only fool who listened to the radio for hours in anticipation. I decided. I would listen to the game. They had to cancel the game the night before due to weather, so they held a double- header downtown. They even added fireworks. No doubt, they were hoping all the people without electric would drive downtown for the game. What an opportunity! Get out of your miserable house and come on down! Yes, whole neighborhoods left in the dark…good idea. Not once, throughout that whole game was there any mention of what had happened in St. Louis. Jack Buck (RIP) would have said something. I would have devoted a whole ten minutes of gratitude to Tom Edison, and how really $%& up the world would be if he had not been born, but that’s why I’m not a sports broadcaster. Sure, the 200,000 people who had electric saw the news on TV. but the other 100,000 were left out in the cold, and clueless. At 2.30. nobody came on to tell the good people anything. I HATE when that happens. I felt like I had been stood up. If you say you are going to do something, well then DO IT. The game was a shutout: 8-0. Cardinals won with some rookie pitcher. I could have cared less. Couldn’t they have at least had a small news break about the electric situation…like around the seventh inning? Sure they could have…I wondered: I know life goes on, but after all…come on. It’s a little bit after 10pm on a Sunday night as I am writing this, and it’s being reported that three Storm Chasers lost their lives, killed by the tornado’s in Oklahoma trying to get a good shot for the big News channels. How stupid is that? Are they that hard up for ratings? What do they tell these guys? And what about this business that they don’t really want to admit to a tornado until they have ‘professional’ come out and declare it such. Is that for insurance purposes? Insurance agent: Uh…I know you lost the whole roof to your house sir, and your car is over two blocks in a tree, but nobody has really confirmed that there even WAS a tornado and so, I will have to list this as wind damage, and of course, we can’t be liable for any water damage caused by the storm, or your fence that is blown down. That’s was added to your policy last year. I’m not sure what I got out of this: But it seems to me that there’s a real disconnect in the media, not only about the seriousness of our politician’s crimes, but the worsening natural disasters that are hitting the United States. 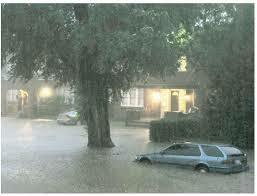 Fires, floods, tornadoes, hurricanes…are good for business. Cars are destroyed, houses have to be rebuilt, food gets spoiled, this is all good for the bottom line. In the meantime, we don’t have to be attacked by any country…the weather is doing a good job of destroying us. And in two days…it happens all over again. You know where I’ll be. I’m flipping my bacon at 5. My thoughts are with you Joy. 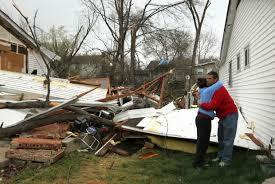 The tornados are a big worry for your friends even though not as immediately dangerous or destabilising. The green hues. Hmmm. I doubt that the TV people artificially created it. I have seen tornado pictures (video) where the entire landscape changed colour three times in ten minutes. Over here in my small part of Oz we do not get tornados -like they do further north in NSW and Qld – but we are in the Roaring Forties and the winds can get high and furious. You know something is about to happen because the sky takes on very strange colours. And, of course, we get the Aurora Australis here too. It is the antipodean (that word again dear heart) Aurora Borealis. Sometimes they are red; sometimes green; sometimes yellow. Sometimes we get multi-coloured ones and many colours in succession. The effect is due to the relative amounts of different elements in the upper atmosphere. 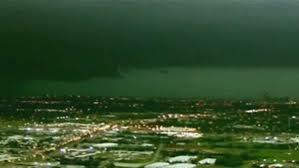 In tornados the colour hues are caused by more localised particles in the air, often over a vast distance. Dirts, sands, topsoils etc from a distance soon fill the air and when large areas of vegetation are affected, the plant life, in torn-apart particulate form, can render a hue to even house and machinery-carrying winds. Meanwhile keep flipping the bacon and don’t eat green slices. Dr Suess was not an MD.